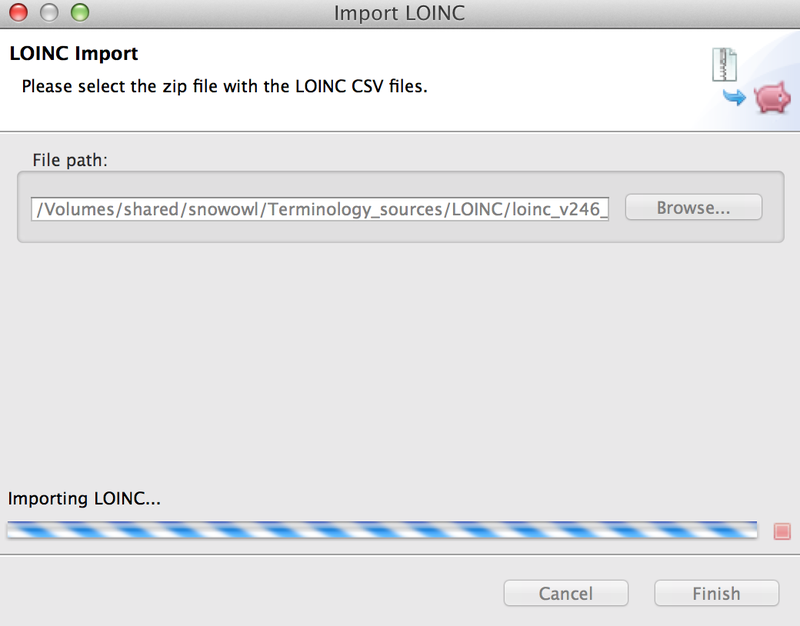 Snow Owl supports importing LOINC releases. Please note that due to licensing restrictions, Snow Owl does not distribute the LOINC release which will need to be obtained from the Regenstrief Institute. Go to File > Import... in the Menu to open the Import wizard. Select Snow Owl > LOINC import from the list, and click Next. On the next page, click Browse to select your zip file, and Finish to start the import. As importing a new release of LOINC will overwrite the previous version, you will be prompted to confirm your command. Due to the size of LOINC the import process can take several minutes. Note: When you are using Snow Owl for the first time, the LOINC view might be empty. In this case, you will have to import the LOINC release file into Snow Owl as described above. To open the import wizard, just click on the link ( Import LOINC from files ...) in the LOINC view.